Lecce, also known as the “Florence of South Italy”, is a medium sized city of 95,200 inhabitants, a city of art with a very old history. Lecce is located in the southern part of the Apulia region, in the Salentine peninsula, overlooks the Adriatic Sea in a cross-border position with Eastern Europe, and covers an area of approximately 238 km2. Lecce’s historic centre is an important tourist destination characterised by rich Baroque architectural monuments made of a local stone called “Lecce stone”. In terms of industry, the “Lecce stone” represents one of the city’s main exports, because it is very soft and malleable, thus suitable for sculptures. 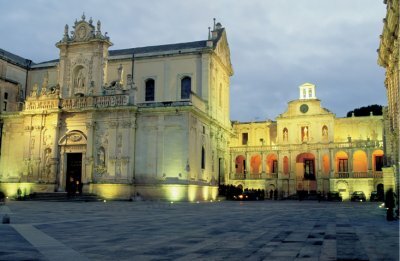 Lecce is also a university city and agricultural centre, chiefly for its olive oil and wine production. Building relationships and being aware of its bordering culture characterise the Lecce territory’s spirit. Crossroads of cultures and connection with the South of Europe and the Mediterranean countries, Salento is the heel sustaining Europe’s future. Lecce Municipality joined the Covenant of Mayors and delivered the Sustainable Energy Action Plans (SEAP) in 2014. Lecce was Italian Capital of Culture in 2015 and has developed some initiatives to increase the energy performances of the existing building stock through the promotion of energy saving solutions and the use of renewable energy sources. Moreover, the municipal policy supports the creation and development of green spaces in the urban built environment in order to improve the air quality and, in general, the quality of life. This project has received funding from the European Union's Horizon 2020 research and innovation programme under grant agreement No 691883.